WHEREAS, there remains many concerns among area agricultural growers regarding the depth of the pipeline in agricultural areas. 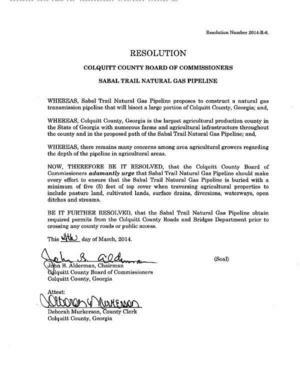 NOW, THEREFORE BE IT RESOLVED, that the Colquitt County Board of Commissioners adamantly urge that Sahal Trail Natural Gas Pipeline should make every effort to ensure that the Sabal Trail Natural Gas Pipeline is buried with a minimum of five (5) feet of top cover when traversing agricultural properties to include pasture land, cultivated lands, surface drains, diversions, waterways, open ditches and streams. 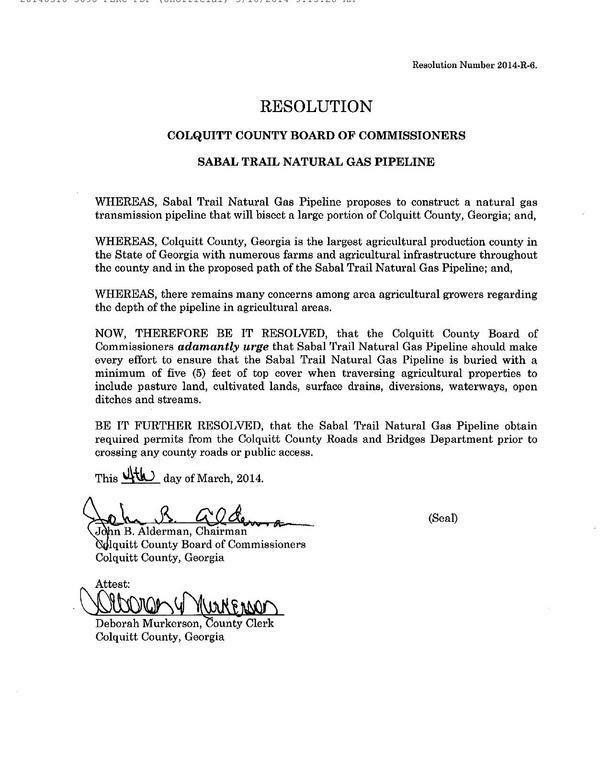 BE IT FURTHER RESOLVED, that the Sabal Trail Natural Gas Pipeline obtain required permits from the Colquitt County Roads and Bridges Department prior to crossing any county roads or public access. This 4th day of March, 2014.